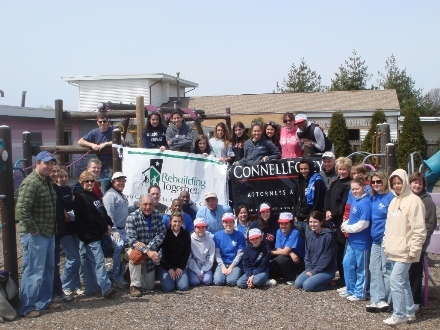 ROSELAND, N.J./May 7, 2007 -- Last month, members of the Connell Foley law firm descended on Jersey City’s Liberty State Park − armed with hammers, nails, and saws − to participate in Rebuilding Together/Christmas in April. The target of their rehab efforts was Camp Liberty, a summertime haven for local children. Since 1974, Camp Liberty has provided area children with cross-cultural arts and education programs. A hallmark of the camp is the clean, litter-free, and open air environment in which the children can play and learn. Christmas in April is an annual effort by one of the nation’s largest volunteer programs, Rebuilding Together. The program’s goals are to preserve and revitalize housing and communities. The Camp Liberty project was spearheaded by the Jersey City chapter, which has made similar efforts since its founding in 1991. The Connell Foley/Camp Liberty team installed over 20 new fluorescent lights, two toilets, three sinks, five windows, and two doors. They assembled and painted 16 picnic tables; painted over 60 benches; spackled, sanded, and painted six rooms; assembled and installed 10 sets of shelving; and cleaned the grounds of the entire camp area.